The She Bold Stock Members received a gorgeous new batch of images this past friday! I focused on a summer lavender lemonade vibe with pops of purple and yellows to go with this collection. The members are absolutely ecstatic with the new website and the sensibility it brings to them searching for new photos by color, type, or collection for their next Instagram post, pinterest graphic, and even their new social media covers! Plus this brand new website allows for easy access to our 1,500 images, social media graphics, and templates that we provide! She Bold Stock proudly introduces you to the Lavender Sunshine Collection for all of my purple lovers out there. If you are in the process of finding the best colors for your brand, give purple hues a shot! 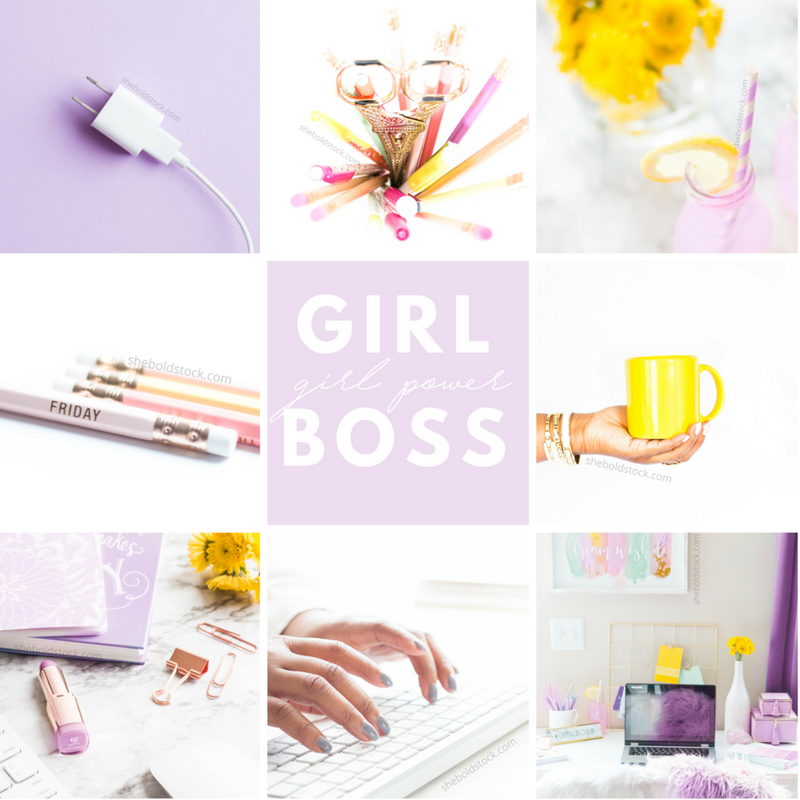 This collection has 25 perfectly designed images that gives off a girlboss vibe with a powerful edge! The collection features horizontal and vertical images for any of your social media needs. I added in rose gold accents, marble backgrounds, and delicate yellow flowers to pull off images a brand that is not only stunning but represents your brand in a powerful new way. Wondering how you can mix and match with other stock photo collections in the membership? Check out this 9-tile insta-grid below.I used several different collections from the library to style this grid including one of the graphics in the latest collection! Imagine what your IG would look like? Select from over a thousand images to find your perfect style! Want to give my images a test run, get these gorgeous beauties when you sign up!